9:30pm Havenot room. Brett to Angela – Essentially they’re imploding right now. Half of them think Rockstar flipped. Half of them think Haliegh flipped. The other quarter (what kind of math is this?) think Scottie flipped. Brett – They’re freaking out. I kind of wish we had kept quiet about it. Bay told me that she thinks Fes flipped. Angela – the only person Bay would use it on is Fes. Brett – we’re in jury! We’re in jury DUDE!!! And honestly this sounds so bad but I am glad Rachel isn’t in jury. Angela – I know. Brett – I cant stand her. If I got stuck up there with you and Kaycee or Tyler.. I would… Angela – try and get close to Bayleigh this week. I think Bay is the brains and Fes is the muscle. Brett – 100%! So then hopefully she won’t use it so that you can get out who you want. What is your explanation to her because you know she is going to push back hard. Why Rockstar? Why Scottie? Angela – Scottie has been telling everyone that if he got HOH he would put me and Rachel up. Now that Rachel is gone, I am his only target. Rockstar has had my name in her mouth this entire time. Maybe she is a pawn and maybe she isn’t but I can never see myself working with her. Brett – so in the event that Scottie comes off who would you think as the backdoor. Fes or Bay? Angela – I don’t know. Brett – I am thinking Bay because she has a lot of power. Angela – you’re right! Brett – so what do you want for breakfast? Angela – egg white, turkey bacon. That’s all. Angela – I was like if I couldn’t trust her (Rachel) do you think any of you could!? F**kers! Idiots! Brett – part of me wants Fes to sweat but its not smart because Bay could use it (power app). If we keep Bay and Fes happy they’re less likely to come after us and maybe go after their side. Brett – Rockstar is never going to be swayed. Angela – the hacker app is a good thing.. it takes the blood off me. 9:50pm Bedroom. Haleigh and Bay. Haleigh – Number one – I felt like an idiot. Number two there are people saying that its me. AKA Rockstar. Bay – that you flipped? Haleigh nods. Bay – really!? 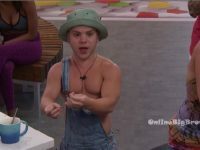 Haleigh – she suggested it to Scottie. Number three – Fes is questioning me because of my convo with Brett. Number four – I feel like I don’t know anything about the situation that Brett called out, I am sad if you opened up to Rachel and not me because I feel like you don’t trust me. Bay – let me tell you this, I didn’t want anyone to know. The only reason Rachel got it out of me is because she came up to my room 18 times while she was on the block crying. I told her she was just a pawn. I was pissed afterwards. Haleigh – because she literally went straight to Brett. Bay – I was so mad at myself. And now the whole house knows. Haleigh – no one knows the details and you can deny it because Rachel is gone. 9:44pm Havenot room. JC and Angela. Angela – we can get drunk tonight and celebrate. JC – I hope to god I get wasted. And then the hacker competition .. f**k it. I know you and Brett have a good relationship but don’t forget that he is going to try and convince you to take out the people that are good for him. You have to be very smart about this HOH and take out the people that will come for you. And the people that you are working with. Angela – he (Brett) is a huge target and our shield. 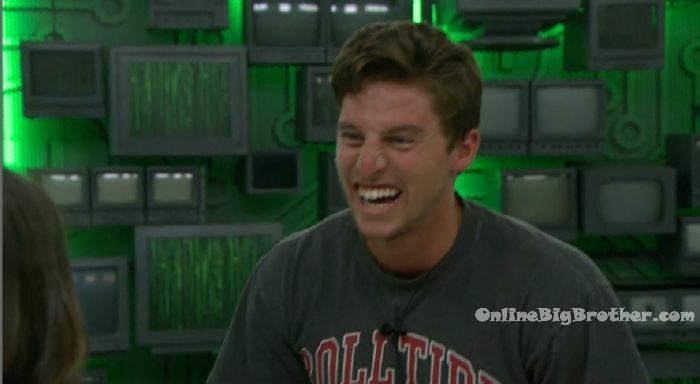 JC – Tyler definitely wants you to take Scottie out. Angela – who is targeting me? 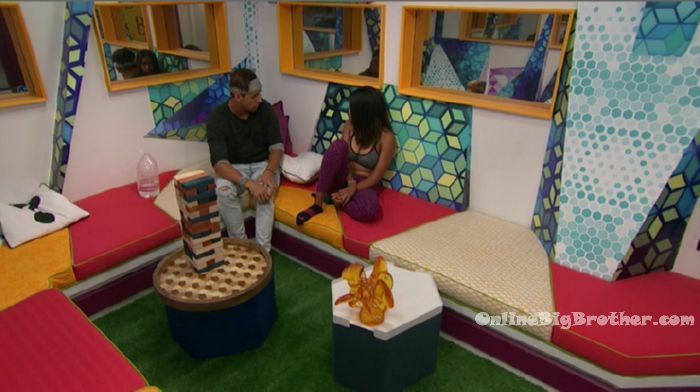 JC – Bay tried to get in an alliance with me and Fes. I play along with it. She talked about you being the only option. The other one is Rockstar. 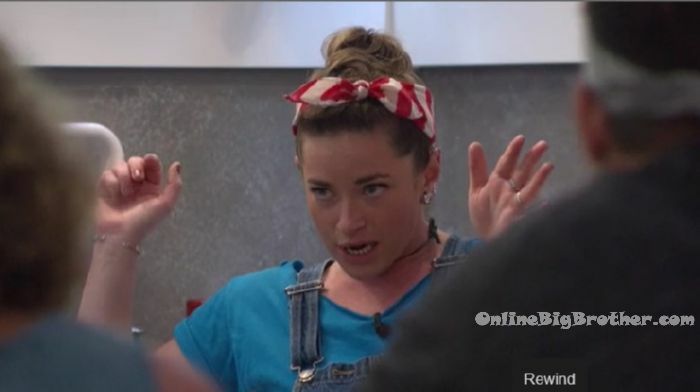 Angela – I am thinking Rockstar and Scottie .. .and then it gives us the option to backdoor Fes or Bay. JC – if it was me I would put up Haliegh and Rockstar. That way everyone knows you’re going after Rockstar. If she had won she would have put up you and Brett. JC – if I get the hacker I will tell you. 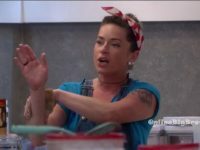 Angela – I think putting up Scottie so that he can win the veto. JC – if you do that make sure you talk to him first and tell him. 10:15pm Havenot room. Kaycee and Angela. 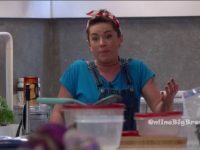 Angela – I think its a good move of putting up Scottie and Rockstar .. then just seeing how the cards unfold because we can’t pla right now. Kaycee – what are you going to tell Scottie. 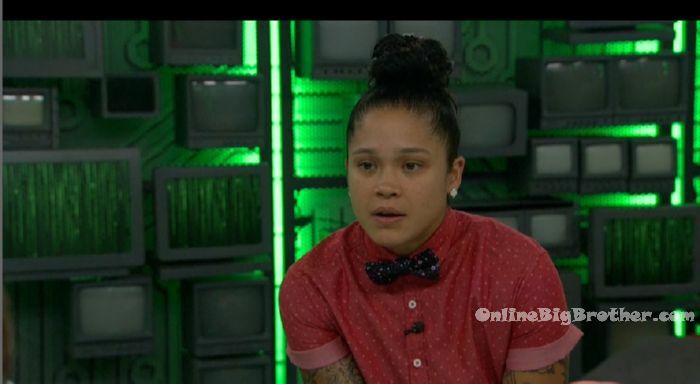 Angela – that he said if he won HOH he would put up me and Rachel and with Rachel gone, I am his number one target. I would tell him that he is my pawn. If everything stays the same then we send Scottie home and we get rid of a snake. Or we backdoor Fes or Bayleigh. Kaycee – they’re so confused over there. 10:15pm – 10:30pm Lounge room. Bay and Fes. Bay – Rockstar – is trying to ride us to the end. She is probably trying to ride Brett to the end. Fes – Brett always pitched to me that you and me work together no one will see it coming because its the last thing. Those two are probably the last two.. Bay – well we should put them up next to each other. Fes – right now. Bay – not right now .. or right now. Fes – I say we f**king use your power because all this sh*ts going to be f**ked up.. there’s the hacker thing tomorrow.. Lets just call their bluff now man!? 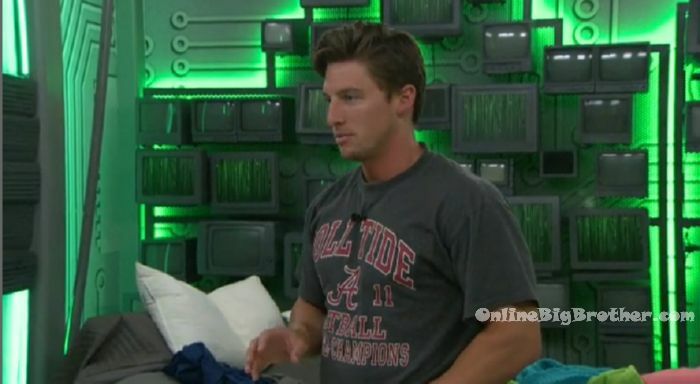 Bay – we have to win that (hacker) because my fear is that if he wins the hacker thing and throws me up. Fes – but look at the numbers. Bay – we can’t trust the numbers. bay – what if Rockstar stays.. Fes – f**k Rockstar! Bay – then I am throwing Brett up twice. Fes – then who would you put up? Bay – There is no one else I would want to put up. You need to take some of the blame. Fes – I will. Bay – one one knows that its you. Fes – my pitch to her would be if you want to put me up because I’m on the other side then put me up.. Bay – never say put me up. That’s what got Rachel put up. Fes – I could tell her if I win the hacker comp I would promise not to use it if she didn’t put me up. 10:24pm Havenot room. Rockstar and Angela. Rockstar – I was going to put up Sam and JC. I thought putting Sam up that would rule out that there’s no girls (Alliance). 10:42pm Kitchen. Sam’s meeting. Sam – we’re going to hold our first house meeting. Some of you have already heard my idea. As you all know I’ve made promises to you. My word is good. I have been 100% honest since I got in here. I refuse to lie and I am here for everybody. Now that we’ve all been thrown this curve ball, its really like they’ve said .. its the second step between the nomination from the HOH and then the veto. Here is the thing we can either plan that someone is going to use it or what if we all just make sure I get it because its anonymous? Scottie – you want me to throw a competition? Sam – yeah Scottie, listen if we leave it anyone could become a target. If I get then I could be everyones target .. so what I am saying is everyone go into the hacker competition and just plain refuse to participate and then I will do whatever to the best of my abilities. I might not win but then we can say Sam has it and I will just vow to not use it. So then it doesn’t exist. 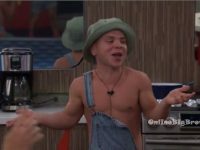 JC – the nominations are before the hacker .. do you think if I am nominated and I have another chance besides the veto … which is the hacker. Do you think those two people are really going to throw it? Sam – it doesn’t ensure safety. Winning the hacker comp doesn’t mean you’re safe. JC – so if you’re on the block you’re going to throw one chance way? JC sarcastically says okay, I agree I’ll throw it! 10:55pm Sam – they already have you worried and paranoid.. lets take that away and make it a normal week. Please don’t put me on the block. I already didn’t think that you would. I will promise to not use it. Or do we all just try and fight for it .. then no one knows who has it and we all just try and f**k each other and POW! If we do this we could repay me for my HOH were there was one vote that was not unanimous. We could fix that! We could all right now unanimously decide to punish me for the whole team. I am offering to do something really stupid. I benefit none from it. Rockstar – I think you are Sam. You’re offering to take control. Rockstar – There have been people that have lied to all our faces. People could sit here and say they’re not going to use it and do it and then we’re not in control of our own fate. 11pm JC comes up with the idea to anonymously vote Fes – so were agreeing to throw the comp for the next two weeks and then you’re safe for the next two weeks? Rockstar – this means that we not only have to trust you we have to trust everyone else. Angela – if someone decides to go against their word then they automatically get the advantage. They are only competing against you. Rockstar – I have experienced lies every week in this house. Its not that people don’t trust you. Sam – its not going to work now because everyone is all shifty eyed. Sam – fine its over, we’re not doing it. Rockstar – I’m just being real. Sam – we have no control. Angela – its just if one person gets tempted by it then we’re all in a worse position. Haliegh – I liked the idea. 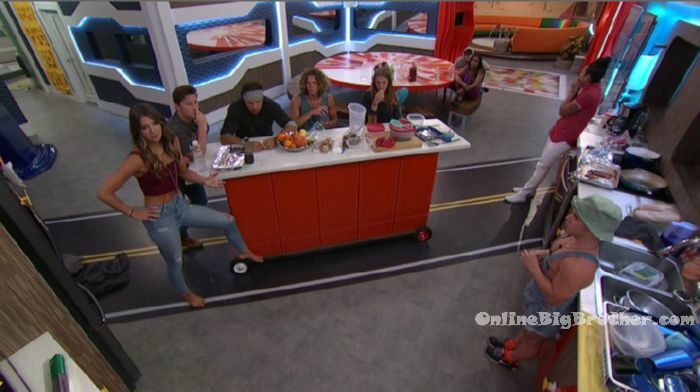 Sam – now everyone go back to killing each other .. I’ll be in the kitchen. You guys seeing yet how nasty Angela is? First the constant bashing, then the comment of “If I were Rachel and I were 30, I would seriously reconsider my life”, now the nasty and unnecessary goodbye message. There’s a difference between being catty in game, and being a personal c*** taking it way outside of the game, and the “Ice Queen” has certainly done that. Rachel was loyal to her, and was genuine friends with her. Apparently that’s how Angela treats her friends. I don’t have an issue with much in this game, or in any season, but this is one of the issues I have a problem with. No one deserves that, and certainly someone as nice as Rachel doesn’t deserve that. Angela shouldn’t have made the comments about the 30 thing. Didn’t like that. I love rachel. She was very nice to everyone on level 6 The thing is rachel threw here entire alliance under the bus. Made multiple final two deals with people. Like u cant do that in this game. 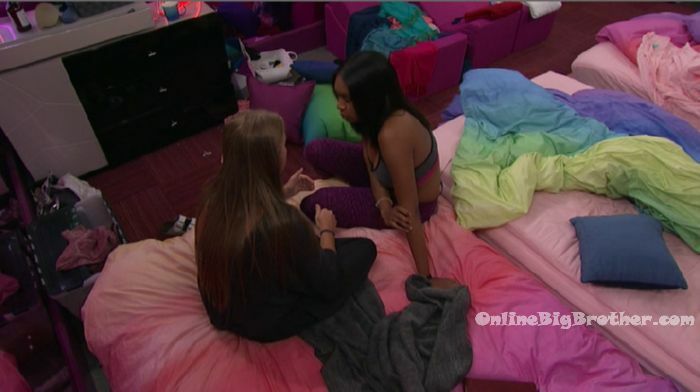 Angela found out that she told bayleigh to put her up as a pawn. You don’t do that to someone that ur close with. This is dang good entertainment! bay’s a fool not to automatically be thinking i’m using the power app this week. she’s basically guaranteeing she gets backdoored. if she uses it at least there’s a chance scottie goes home instead of her. Please send Sam back to the woods she crawled out of. What an asinine idea. She really thought that they were all gonna go for that? This season is good, I gotta say. So many dumb people together in the house…they all just crack me up. Expect the Unexpected for sure! Not from the doctor (dumb name) but from the players! Famous last words in this house … “trust me”. Sam is asking for complete control over everyone? Yah right. Especially since no one knows who the hinky votes are or if there is more than one turncoat. Was she naive or sly, who knows with her? Angela came out of her cocoon but not as the butterfly we expected from that petty soft face. She could be the example for mean girls everywhere but with brains. I was on the edge of my seat at the final two in last night’s HOH comp, I didn’t realize how much I loved this season until now. Aside from production interference with all the twists, this is one of the best seasons. Great cast of fairly decent people with brains and game play and better language skills (fewer F bombs, more articulation) and also some real characters. I don’t think Bay wants to use her power unless she is up herself and I don’t blame her but that wouldn’t make her small team very happy and in fact may not leave her with a team. She’s going to be unhappy now which will be a great comeuppance after her nasty Queen HOH itis. I couldn’t believe that came from Angela. I understand her good-bye message to Rachel but the age comment wasn’t necessary. As for Angela being a mean girl, maybe she should hang out more with rocky. Rocky is the worse of the worse when it comes to mean. If Bay is such so smart and wants to be a doctor why isn’t she in med school? Flight attendants don’t make a ton of money( and think she wants to have a ton of money– either making it herself or marrying someone with it) And I doubt she is a flight attendant for the traveling. It takes years before a flight attendant is able to get and keep a good flight schedule. Her family looks like they have money so I doubt she has to work to be able to afford med school.